Neon, the distribution house who has produced recent favorites such as I, Tonya, Vox Lux, and Three Identical Strangers continues its run of making real competition for prominent indie studios like A24 with what might possibly be the most outrageous film we see all year. While the studio released a first look at the film a couple of months ago they have now released a second, red-band trailer for the film allowing it to seemingly market itself in its truest and most liberated fashion. Writer/director Harmony Korine‘s comedy starring Matthew McConaughey as a “rebellious rogue” named Moondog living large, mostly high, and completely by his own rules in Miami is about as much as one can derive the movie is about from either trailer though. What makes the lack of any insight about the film in terms of its objective or what it hopes to relay is the sheer amount character, mood, and tone put forth in the images we have seen thus far. While McConaughey's stock has certainly taken a dive over the last few years post-Oscar win (last weekend's Serenity made for the star's sixth straight critical and commercial live-action flop following The Sea of Trees, Free State of Jones, Gold, The Dark Tower, and White Boy Rick as even his two animated films, Sing and Kubo and the Two Strings, either didn't perform critically or commercially), but with that in mind the guy is do for a win and if anything might bring him out of a funk-at least critically-it's that of a collaboration with Korine. The filmmaker originally made his name by writing the 1995's controversial Kids, the NC-17 drama that featured Chloë Sevigny and Rosario Dawson in their film debuts, but went on to wider acclaim after writing and directing 2012’s Spring Breakers and as this will be Korine's follow-up there is definitely a certain amount of anticipation-let's just home the filmmaker isn't peddling the same themes here as the setting, color palette, and character traits all share more than a little in common. The Beach Bum also stars Isla Fisher, Zac Efron, Snoop Dogg, Martin Lawrence, Jonah Hill, Jimmy Buffett, Stefania LaVie Owen, and hits theaters on March 22nd after making its world premiere at the 2019 SXSW Film Festival. 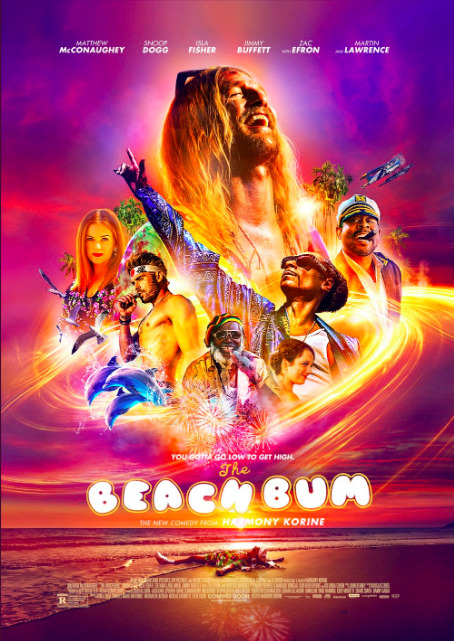 Synopsis: THE BEACH BUM follows the hilarious misadventures of Moondog (Matthew McConaughey), a rebellious rogue who always lives life by his own rules. Co-starring Snoop Dog, Zac Efron, and Isla Fisher, THE BEACH BUM is a refreshingly original and subversive new comedy from director Harmony Korine (Kids, Spring Breakers).